Accusing the Congress of adopting a "soft approach" towards terrorists and Naxalites, Uttar Pradesh Chief Minister Yogi Adityanath said on Monday that China and Pakistan no longer indulge in adventurism as India now has a strong government led by the BJP. Addressing a rally in the steel city of Rourkela, the firebrand BJP leader also said "infiltration by the Chinese army, a regular affair during the Congress-led UPA government, ended after Narendra Modi became the prime minister". "Similarly, Pakistan was chopping off the heads of our soldiers on the border during the UPA rule. Now, with Modi as the prime minister, China and Pakistan cannot afford to indulge in misadventures," Adityanath said. Referring to India's response to the Pulwama terror strike, Adityanath said, "Pakistan was given a fitting reply after the killing of 40 CRPF jawans". "India's action was not just confined to destruction of terror camps. It was a strong step towards breaking the backbone of Pakistan," he said, adding that the BJP has "zero tolerance" towards terrorism. Coming down heavily on the Congress, Adityanath alleged that the country has failed to take giants strides on the road to development due to the soft approach of the grand old party towards terrorists and Naxalites. 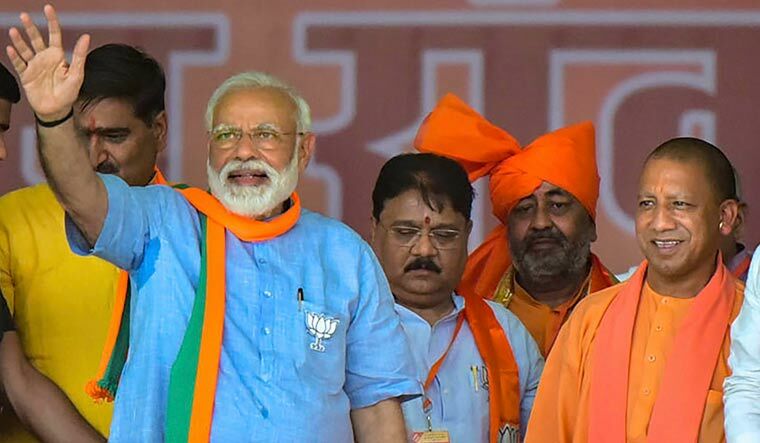 "A strong Modi wave was sweeping across the country," Adityanath said, urging the people of Odisha to vote for a double-engine government of the BJP at the Centre and the state.